Looking for an epic date night in Bangkok that won’t break the bank? 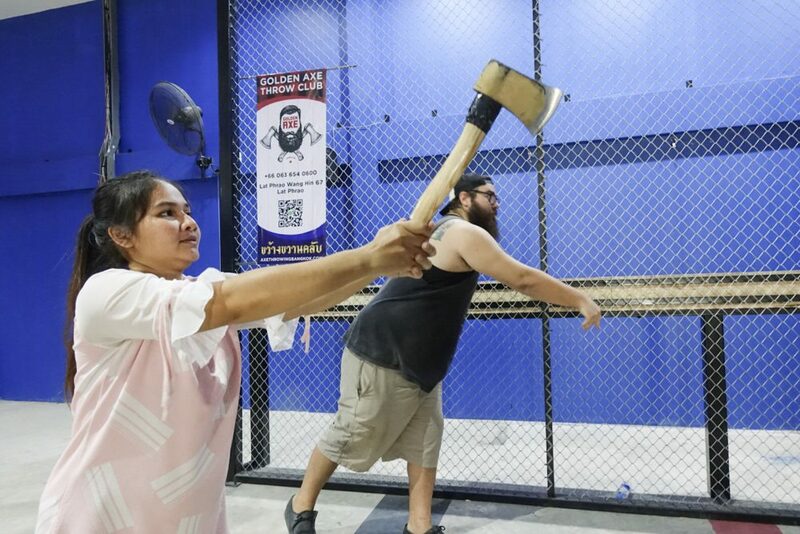 Check out these recommendations by the Golden Axe Throw Club for fun Bangkok activities for couples. You’ll be sure to earn brownie points for creativity & originality! Start the Night Throwing Axes! Yes, you heard us correctly! 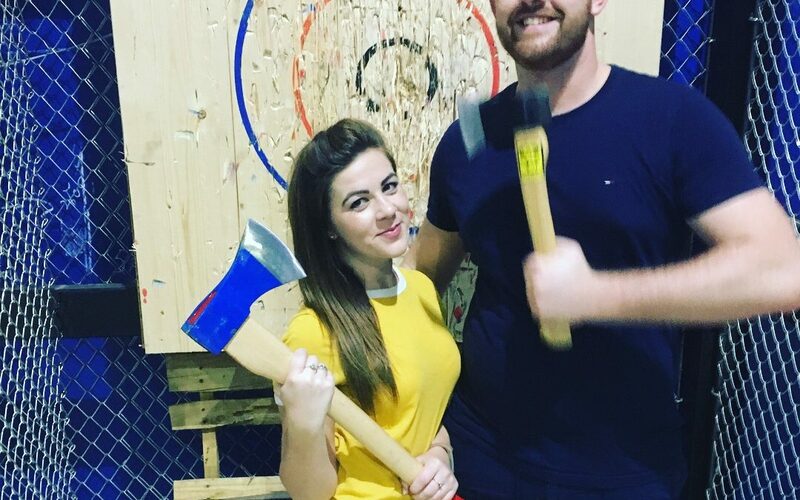 Forget about bowling, start your date night with some friendly competition via throwing axes. 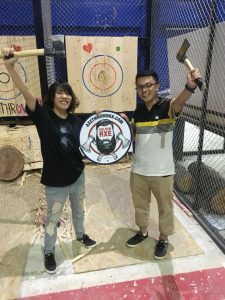 Bangkok’s first & only axe throwing venue & bar opened in December 2017, and promises an axe-hilarating time for couples in Bangkok. This crazy Canadian sport is more legitimate than it sounds, and follows strict safety protocols to make sure your date night doesn’t end in the ER. For 1 hour, you can rent 2 targets for 500 baht per person (1000 baht per couple), and throw all the axes your heart and inner-lumberjack desires. They even have a Game Of Thrones-esque Iron Throne to sit upon for the winner, and a Street Fighter style VS wall to takes pics with against your beau. While you’re working up an appetite axe throwing, order in some Za from Alola Pizza Bistro & Bar just around the corner, or order it in during your axe throwing event. The chef has curated a lengthy menu of delicious Italian style dishes. Several pizza & pasta options, including authentic Bruschetta Arrabiata, Insalata Caprese, or classic Margherita Pizza. 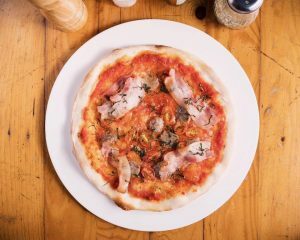 Best pizza options in Bangkok is a hotly contested debate, but we feel that their Alla Salsicia Pizza with homemade Italian sausage & pecorino cheese topped with smoke bacon, takes the top pizza crown in Bangkok. Alola Pizza also has a nice little selection of Craft Beer for the enthusests, as well as live acoustic music every Saturday night starting at 8:30pm. 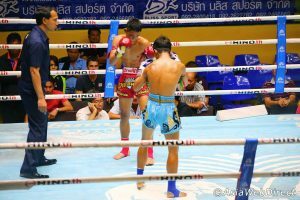 Just a short 8km taxi ride from Golden Axe Throw Club, make sure to keep that competitive spirt alive with some good old fashioned Muay Thai at Thailand’s most famous boxing stadium, Lumpinee Boxing Stadium. Do a quick google search, and make sure you’re not getting directions for the older stadium listing on google maps (search New Lumpinee Boxing Stadium). 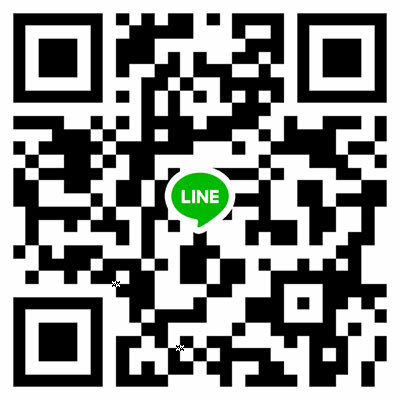 There are 3 options for tickets, 1000 baht, 1500 baht & 2000 baht. There may be “agents” trying to sell you the 2000 baht ringside tickets, which gets you nice and close to the action. Instead, head straight to the ticket booth. Opt for the cheapest 3rd level, 1000 baht seats, and sit amongst the locals. The exciting chaos that results in them betting and cheering is a spectacle to behold in itself. Once you make your way to the 3rd level, head to the immediate right or left end aisles, as most Thai people squeeze into the middle. The ends of each side aisle are usually empty and you can space out nicely. Cans of Chang cost 60 baht.